James David Lōser, or Jim as his friends and neighbors call him, and his wife Leslie Robson have been residents of Huntley Hills since October, 1996. He received his undergraduate degree in the arts from West Liberty University in West Liberty, WV. It was there that he fell in love with painting, especially the works of Matisse and the Fauves and their heirs, the Abstract Expressionists. The photo, taken by Hal Padgett, shows Jim sorting through his paintings in his basement studio on Longview Drive. Jim received his Master of Fine Arts degree from Florida State University where he studied with the British painter Trevor Bell and American printmaker William Walmsley among other fine teachers and guest artists. He has been an adjunct instructor at Florida State and a Professor of Graphic Design at the Savannah College of Art & Design. Jim has also worked as a creative director for over twenty-five years. He currently works in a variety of mediums including drawing in pencil, pastel, pen and ink and painting in acrylic, often with collage and mixed media on canvas, wooden panel or paper. These are abstract works primarily influenced by the natural world and much informed by a sense of place and time. With his expressive use of color and his free and imaginative use of perspective he defines a world familiar yet unlike any other. Jim had a featured exhibition of over thirty of paintings and drawings in the main gallery of the Panama City Center for the Arts, in historic Panama City, Florida. The solo show will ran from October 28 until December 10, 2016. Visit www.centerfortheartspc.com for more details. 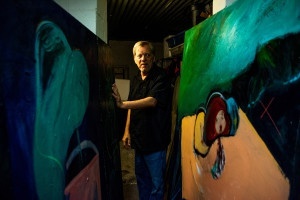 Jim has exhibited his work in London, New York and the Southeast United States. His work is in several permanent collections and numerous private collections. See his facebook page at https://www.facebook.com/jamesdavidloserart and website: www.jimloser.com.